This week on “Red Band Society,” the writers made John Hughes roll over in his grave with a high school dance so boring it made Samantha Baker’s 16th birthday look like fun. It’s the annual homecoming dance at Kara’s high school, and despite the fact that her heart is probably going to give out on her at any moment, she’s determined to suffocate herself in the tightest dress possible and go, no matter what. “I could potentially never live to see another homecoming again,” she sobs to Nurse Jackson while faking tears and blasting ‘Say Something’ on repeat. It’s pretty clear Kara’s faking the whole thing, which gives us a kind of disturbing look into her character. Those words are very true, and she still can’t manage a real tear? Anyway, once she shows up at the dance, she’s immediately taken aback by how…nice everyone is being. 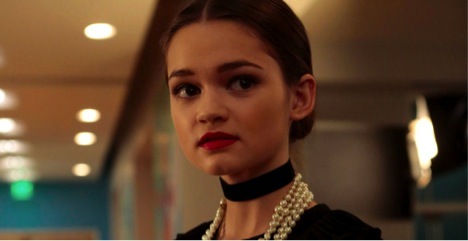 She smears lipstick on purpose onto a fellow mean girl and the girl…compliments her? Before she can even realize what’s going on, former friends of hers are shoving memorial videos in her face and talking about how much they’re all going to miss her. That’s when she realizes this isn’t a homecoming party: It’s a pity party. And the only thing Kara hates more than being nice to other people is pity. Meanwhile, Nurse Taylor Swift is devastated over a breakup with her boyfriend (what, is she going to write a song about it?) and thinks attending Kara’s homecoming dance as her chaperone is the perfect (and vaguely pedophilic) way to get over the breakup. She brings Emma, who is dressed as Daisy Buchanan’s emo younger sister, as her date. Of course, Leo’s still intent on winning Emma back, so what do you know? He’s there too, carrying a rose for Emma that he “stole out of a dead guy’s room” and wearing a poop-brown colored suit (Did he steal that from the dead guy too?). Emma is approached by a fan club of sorts, a gaggle of girls that are beyond excited to “see a size triple-zero in the flesh.” The scene was borderline disturbing – Emma is clearly suffering from a serious illness and people fawning over her will only encourage her to continue to starve herself, an effect we see later in the episode. Kara is crowned homecoming queen, much to her disdain, but Leo comes to the rescue by hopping on stage and declaring her undeserving and the meanest person he’s ever met. And she’s totally thrilled because for once, someone isn’t pitying her. Back at the hospital, Dash and Jordi head to the movies in an attempt by Jordi’s mother to bribe him into loving her. But while there, Jordi’s illness takes a turn for the worse, prompting him to collapse and leading to Dr. McAndrew declaring, “You can’t just let a sick kid walk out of the hospital!” It’s significant because it’s the first reasonable thing anyone’s ever said on this show. Jordi makes it back to the hospital and when he wakes up, finds his mother to be nowhere in sight, prompting a sad flashback to when she left him on the bus headed to his grandmother’s house in Mexico and never returned. Are ‘singles benches’ at dances actually a thing like they are in the movies? I’ve literally never seen one. Do high school kids actually look/dress like this in real life? Because I definitely didn’t look like this in high school. Do all doctor’s lounges look like they do on this show? It’s kind of how I always imagined the forbidden teacher’s lounge in elementary school to look. It has a massage chair and porch furniture and a kitchen worthy of its own HGTV show. What happened to Charlie and why does his dad sneak around with a guitar singing songs?